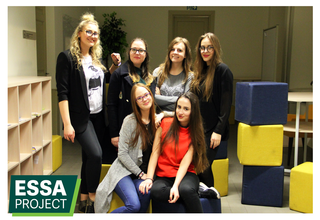 While the majority of students are looking forward to the weekends, 6 students, recruited by the members of Kaunas University of Technology Students’ Union, spent their Fridays and Saturdays in the Design Thinking Lab of the Faculty of Social Sciences, Arts and Humanities in KTU. During the 6 day intensive training throughout the 24th of March and 15th of April, the students were trained as auditors and studied how to audit university‘s social responsibility (USR). 6 students, representing social sciences and humanities, were trained for the first audit of USR in the University of Edinburgh. After using Design Thinking learning methods in the Auditor Training Programme, students agreed upon the fact that the training was informative and effective – they examined what an audit is, what are the main criteria in benchmarking USR and what kind of methods should be used to audit USR.. During the Auditor training participants were introduced with the project, its partners and received the basic knowledge about social responsibility. After a theoretical introduction to the European Benchmarks of USR, students tested the first tool of the research – the observation method, through which they evaluated strategic documents and analysed how statements of USR are implemented at Kaunas University of Technology. Practical observations and analysis of documents helped to memorize theoretical input and, according to the participants, the method consolidated the knowledge about university‘s values, promoted in strategical documents. The fifth day of the training required a great amount of preparation from the students since students practically carried out focus group interviews and tried out methods of auditing with representatives of Kaunas University of technology. Guests from the KTU Central Administration were invited to the focus group discussion, including the Director of Study Department, representatives from the Departments of Social Sustainability and International Development, as well as a representative from the Student Information Centre and the International Department. „During the training practical tasks were the most satisfying for me, especially knowing that we had a chance to do a part of the audit for our own university at KTU. If I had to choose the greatest experience so far, I would select the focus group with the staff of KTU because during the preparation of the group and the process itself, I understood how we will actually feel in the University of Edinburgh: participants of our focus group were not part of the project, they were not prepared and told what to say or what topics will be discussed – everything was very realistic and, in a way, spontanous“ – states one of the participants of the Auditor trainings, Monika Samuolytė, sharing her impressions. During the focus group students who are going to be auditors at the University of Edinburgh discovered sometimes unnoticeable details of social responsibility in the university along with two areas belonging to the European Benchmarks of university social responsibility – foreign students and staff integration, and aspects relating to academic freedom (particularly of the module evaluation surveys and feedback provided to students). The surprisingly active discussion positively inspired student-auditors – university’s employees are familiar with the concept of “social responsibility” and are working towards improving the university so it would meet even more of the European Benchmarks. „After having an overall look at the fact how professionally social responsibility is implemented in the University of Edinburgh and its structure, I believe that it will be a great challenge for us, students, to do the audit there. Hopefully, we will be able to get acquainted with the University‘s culture and community, see how every aspect of USR is developed and, of course, bring back the positive experience to our own university in Kaunas“ – states Agne Medekšaitė. The Auditor trainings and the preparation for the audit, which was divided into four weeks, did not feel too long. On the contrary, the students believe that the information provided will not only help while auditing the University of Edinburgh, but while continuing their studies as well. The audit, which will take place during 24th-28th of April, will be the first of four project crowning audits in different European countries, therefore, not just student-auditors, but the organisers are waiting eagerly for the arriving students from Kaunas University of Technology and the University of Porto.